The other day, we noticed a large nest high in a sparsely foliaged Swamp Gum right beside the Broadford-Flowerdale Road, west of Strath Creek, in the intermittently-flowing Queen Parrot Creek. 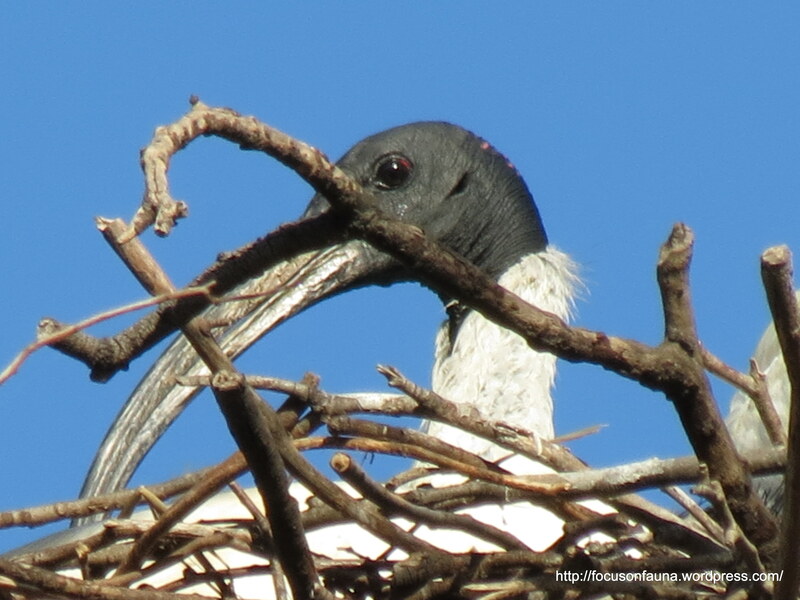 It turned out to be an Australian White Ibis nest, with 2 adults and a pesky youngster, apparently close to fledging. What is unusual is that these ibises commonly nest in colonies, sometimes with the Straw-necked Ibis, whereas this nest was isolated. Also it is probably more usual for them to nest lower to the ground in secluded cover with a more reliable water-body nearby. The chick was certainly insistent in its calling, as can be heard by clicking on the icon below. This is the second year that I know of, that they have nested there. You are lucky to get such wonderful photos.